Galderma are surely confirming that the development of Sansrosa 0.5% Gel (CD07805/47) is nearing completion, with the posting of a proposed comparison trial with Finacea. The trial NCT01659853 will compare how effective Sansrosa is compared to Finacea. The primary outcome will be to assess, after 15 days, an improvement in facial redness. The secondary outcome will be an assessment of the reduction in redness 30 minutes after the treatment is applied. A swap over will occur after 15 days of the first trial, where those in the experimental arm will join the active comparator arm, in order to be able to show that the active ingredient in Sansrosa in able to be convincingly compared to Finacea Gel. The trial is to be conducted at 2 sites in Kentucky and Texas. Can I Join The Trial? To be included in the trial subjects need to have been diagnosed with facial rosacea, and have moderate to severe erythema (redness). Subjects should not have any papules or pustules, or only mild lesions. The purpose of this study is to compare the efficacy and assess the safety of CD07805/47 gel 0.5% applied topically once daily versus azelaic acid gel 15% applied topically twice daily in subjects with moderate to severe facial erythema of rosacea. Subjects who will receive CD07805/47 gel 0.5% and CD07805/47 gel vehicle during Period 1 (baseline to Day 15) per subject’s randomization scheme will switch treatment arms in Period 2. Subjects who do not receive CD07805/47 gel 0.5% and CD07805/47 gel vehicle during Period 1 will receive CD07805/47 gel 0.5% and CD07805/47 gel vehicle in Period 2 (baseline to Day 15). Subjects who will receive azelaic acid gel 15% during Period 1 (baseline to Day 15) per subject’s randomization scheme will switch treatment arms in Period 2. Subjects who do not receive azelaic acid gel 15% during Period 1 will receive azelaic acid gel 15% in Period 2 (baseline to Day 15). I would think it would be no comparision, Sansrosa should be much more efficient at reducing redness. I wonder if the real aim is to be able to show that Sansrosa is the most effective redness treatment available – and base marketing material on that fact? 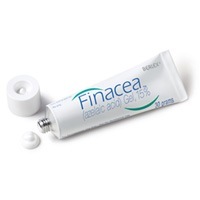 God help us if it isnt better than finacea at improving redness that stuff is pretty much useless.Its been soooo long in the waiting.Wonder if it will be released into Australia? I use Finacia every day and I can’t say it’s had any impact on my redness but it worked wonders on with my P&Ps – I may get one every three months. I also wanted to share my success with IPL and PDL treatments. I have seen about an overall 70% – 80% improvement with some days and weeks better than others. My redness and burning was so severe and I think I was about 2 years ways from being unable to function.